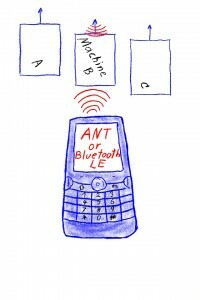 Last week I proposed to one of my project customers to use an ANTplus (ANT+) powered smart phone as remote control for their machines. As we all know, there is no Bluetooth LE available. The other reason was that the costs for qualification with ANTplus are much lower than with Bluetooth LE. Even if we will have both technologies in our phones later on, ANT+ will be the best option for small to medium volumes. My project customer has several machines at the same location. With ANTplus I can create a mesh net. If I am informed right, then mesh is not supported with Bluetooth LE. Everybody who is interested in cost savings, economic M2M concepts or information on ANT+, WSN and smart phones in M2M is welcomed to send me an e-mail by using the form here or by e-mail to harald.naumann (at) gsm-modem.de .